Address: Casilla 01-05-1847 Cuenca, Ecuador, S.A.
Name of your sending organization: One Mission Society, Org. Name of the states or countries where you have served: Ecuador. Year Calvary Bible Church began their support to you: 1989 (As far back as our records show). Focus of your missionary activities (church planting, translation, medical or other): Medical Translation, Seminary directing and teaching, academic dean. 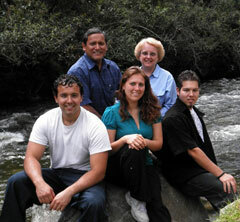 Your home church or sending church: Seminary Evangelical Church, Cuenca Ecuador.